Artetude Gallery will host an Open Reception with refreshments during the upcoming Downtown Asheville Art District (DAAD) Art Walk, 5-8pm, Friday, April 5th. Look for the "Artist in the Window" : Asheville artist Jo Ridge Kelley will be working on one of her latest paintings at Artetude during our Open Reception and looks forward to meeting you and discussing her work. Please join us and enjoy a libation while viewing our current exhibition of contemporary landscape and Waterdance paintings by Asheville artist Jo Ridge Kelley, "Simply Elegant". as well as some of the finest and most compelling contemporary painting, sculpture, photography and monoprints in Asheville and Western North Carolina. Download a free Gallery and Trolley Map for this Friday. 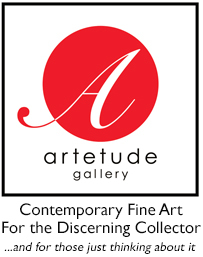 Artetude Gallery is No. 5!